I wasn’t always overweight. I was completely within the normal range when I was born. But as I grew up, I also grew out. Last night, I rummaged through my old photos to find a “before” picture to show you, but as any pleasantly plump person will tell you, photos are your enemy when you’re horizontally inclined. So it was difficult to find any photo of me before I ended my love affair with lard. I found something, though. It’s not necessarily me at my heaviest, but it’s pretty darn close. Just like ripping off a band aid, I guess I’m going to have to show you this as quickly as possible and hope it hurts less. Before – I know it was a bad hair cut. Leave me alone. I thought I was stylin'. When I was rocking size 24 jeans and shopping at Lane Bryant I remember dreaming about being a size 18. That’s right. I thought everything would be right in the world if I could just shrink down to a slim size 18. I’ve always wanted to lose weight* – I was a huge fan of Richard Simmons in his shorty shorts and Oprah in her skinny jeans. And I couldn’t tell you exactly when things clicked for me, but I finally started seeing results in college. That’s right. When girls were gaining their Freshman 15s, I was giving mine away. I guess I'm a little backwards that way. The weight came off slowly … sometimes too slowly. 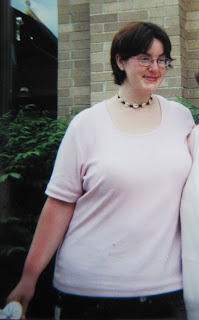 And now, 10 years later, I’m here to report I’ve lost 100 pounds and still haven’t reached my goal weight. I know. I’m slow. Sure, I’m damn close. But those last 10 or 15 pounds are so much harder to ditch than the first 15 or 20. So, although I’m not an expert, I’ve been there. I’m still there. And I’ll be there with you. Even if you don’t reach that magic number or fit into those skinny jeans by the first day of summer, if you make a change in your life now, you’ll feel better. You’ll feel so much better. And maybe you'll even get a better hair cut like I did. Who knows. If you haven’t joined the Weigh In Challenge, it’s not too late. Email me at WeighIn@captivate.com. And good luck trumping temptation this weekend! 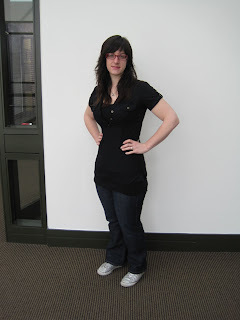 This entry was posted by kate, on Friday, March 26, 2010. You can leave your response . What ended up working for you?